When the weather turns crisp in San Diego, apple season starts in Julian. Every fall, San Diegans make the one-hour drive to Julian to experience a rustic mountain town and, most importantly, its pies. At 4,235 feet above sea level, Julian's four-season climate and crisp mountain air ​make it ideal for growing apples. Julian residents make good use of the local produce, baking apple pies worth a trek from the coast or even from across the country. With apples from their own orchard (which includes more than 17,000 apple trees), Julian Pie Company turns out pies with moist centers and either flaky or crumb crusts. Julian Pie Company started producing its renowned pies in 1989 and bakes traditional apple pies, plus many variations of apple combined with cherry, boysenberry, raspberry, blueberry, strawberry, or rhubarb. You can also order pecan pies and pumpkin pies or a pie with an all-fruit filling that doesn't include apple. The Julian Pie Company is housed in a small building that looks like a house just off the main street in Julian. There are outdoor picnic tables to enjoy your slice of pie on or a row of tables indoors. Try a scoop of Julian Pie Company's cinnamon ice cream to go with your pie. You can also order your apple pie with melted cheddar cheese on top. Many of the Albertson's, Jimbo's, and Stater Bros. grocery stores in San Diego County carry Julian Pie Company's pies. You can also find them at independent grocers such as Cardiff Seaside Market, the Olive Tree Marketplace in Ocean Beach, and Baron's Point Loma. A mom does indeed own Mom's Pie House, and she has lived in Julian for more than 30 years. She started baking pies using Julian apples in 1984. The entrance to the shop takes you down a long corridor past the open kitchen and into a cozy dining room, where you can enjoy a slice of pie and maybe an added scoop of ice cream. The shop produces two renowned crusts: the flaky (a pastry-style crust), and the crumb (a sprinkled crunchy pie topping). Mom's Pie House makes many variations of apple pie, including the apple caramel crumb pie and apple sugar-free pie. You can also choose apple boysenberry or apple cherry pie with either a flaky or crumb crust. Mom's also serves pecan, pumpkin, rhubarb, cherry, and peach pies. Mom's delivers pies straight to your door in San Diego with their online ordering system. You can also buy Mom's pies at Don's Market in Santa Ysabel. Owned and operated by a husband and wife team, this little bakery in Julian serves up apple pies made fresh each morning. The interior of the bakery feels like a cabin, but with ample seating. Outdoor tables mean you can enjoy your pie in the crisp Julian air. Apple Alley Bakery introduces some fun twists to apple pies, including a mango apple pie and a caramel apple pecan pie. Apple Alley Bakery also serves sandwiches and soups for lunch. 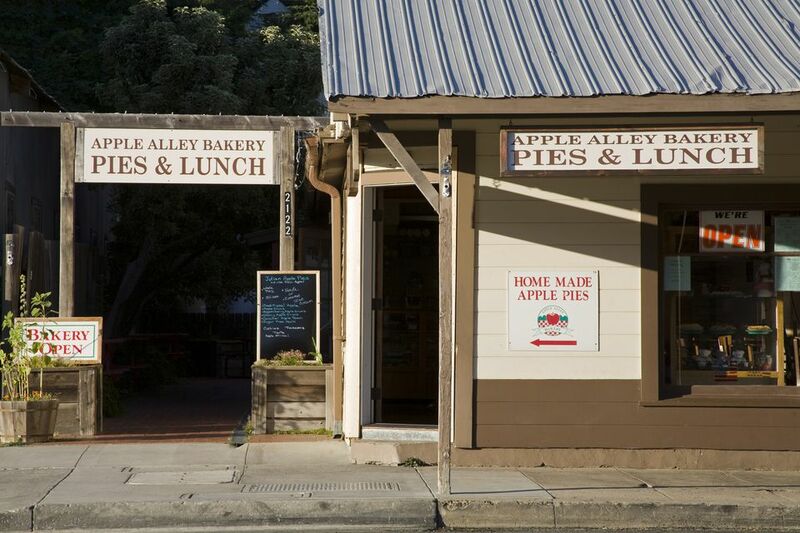 You must make the trek to Julian to sample these pies, as the bakery does not sell them outside of the mountain town. Julian Café and Bakery is a small restaurant housed in a cozy log room. At the restaurant you can find some good comfort food like chili, meatloaf, and country fried chicken, followed by a slice of pie. Or, just step right up to the pie-ordering window on the side of the restaurant, where you can quickly pick up a pie to go. The pie standout at the Julian Café and Bakery is the apple pumpkin crumb pie, which layers creamy pumpkin pie on top of soft apples, topped with a crumb crust. Julian Café and Bakery sells the apple pumpkin crumb pie seasonally (it makes a great addition to Thanksgiving dessert selection). Its other pies (apple crumb, apple pastry, and apple boysenberry) are available year-round. This pie shop only sells in Julian.